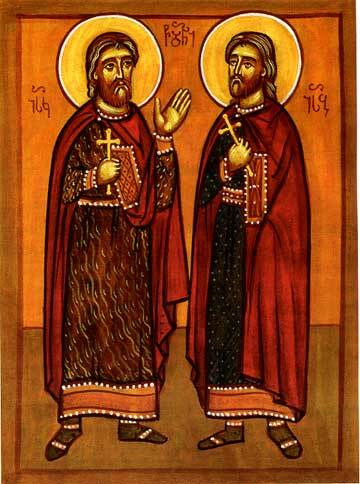 The Holy Martyrs Isaac and Joseph, brothers by birth, were born in the city of Theodosiopolis, or Karna (now Erzerum). Their father was an illustrious Moslem, but their mother – a Christian. The good and pious woman educated her two sons, and also an older one whose name is uncertain, in the Christian faith. Having reached the age of maturity, all three brothers – Joseph alone being married – wanted to depart their Mahometan father in order confess their faith in the Lord Jesus Christ without hindrance. They recoursed by letter to the Byzantine emperor Nicephoros I (802-811), requesting his permission to resettle at Constantinople and to enter into service at his court. Having received a favourable reply from the Christian sovereign, the brothers began to ready themselves for the journey. The eldest soon set out for Constantinople, but Joseph and Isaac were detained by order of the emir of Theodosiopolis. Questioned about the purpose of their journey to Constantinople, the brothers answered, to the surprise of all those present including their father, that they were Christians from the time of their birth and therefore they were fleeing the impious, and wanting to confess freely their own faith. Neither by enticements nor by threats were they able to sway the brave martyrs. Having convened an assembly of officials, the emir sentenced the brothers to death. At the place of execution, on bended knee, Saints Isaac and Joseph offered up prayer to the Lord, after which the executioner chopped off their venerable heads. This occurred in the year 808. Upon the unburied bodies of the holy martyrs by night came down and shone an extraordinarily bright column of light over them. Struck by this sign, the Mahometans the next day besought the Christians of the city to give burial to the bodies of the holy martyrs. Later, at the place of burial of the saints was built a temple and consecrated in the Name of the MostHoly Trinity.